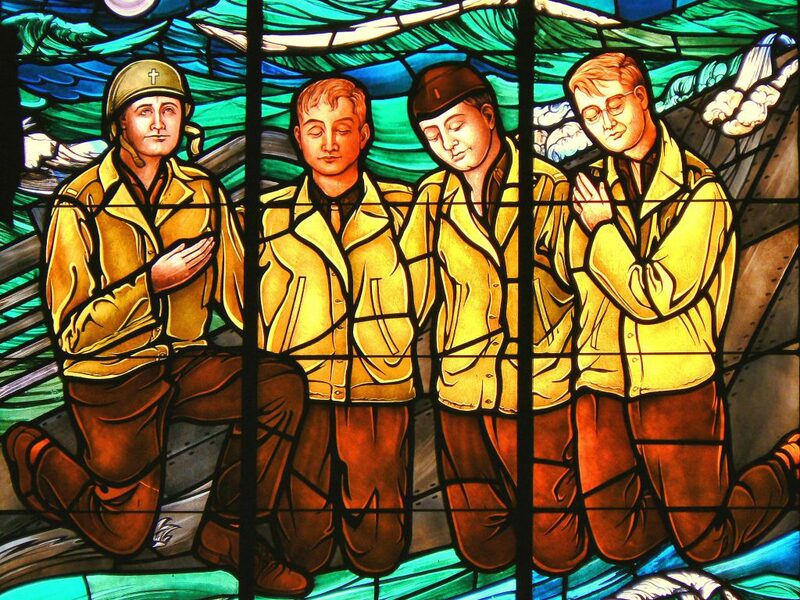 The Four Chaplains, also sometimes referred to as the “Immortal Chaplains” or the “Dorchester Chaplains”, were four United States Army chaplains who gave their lives to save other civilian and military personnel as the troop ship SS Dorchester sank on February 3, 1943, during World War II. As soldiers rushed to lifeboats, Reverend George Fox (Methodist), Jewish Rabbi Alexander Goode, Reverend Clark Poling (Dutch Reformed) and Father John Washington (Roman Catholic) comforted the wounded and directed others to safety. One survivor watched the chaplains distribute life jackets, and when they ran out, they removed theirs and gave them to four young men. As the Dorchester sank, the chaplains were seen linked arm in arm, praying. Ceremonies and services are held each year on the first Sunday in February which is known as “Four Chaplains Day” by The American Legion. American Legion posts nationwide remember Four Chaplains Day with memorial services that pay tribute to the courageous chaplains and the brave young men who lost their lives on that fateful night. The event honors the Four Chaplains and ensure their legacy of brotherhood and selfless service. May they be remembered for generations to come. Manassas Post 10 will have a ceremony at 11:00 AM. Warrenton Post 72 will have their normal Sunday breakfast starting at 9:00 AM which lasts until 1:00 PM. Post members are encouraged to attend the ceremony at Remington Post 247. Remington Post 247 will have a special ceremony starting at 2:00 PM. Light refreshments will be served at the conclusion. Stafford Post 290 will have a ceremony at 1:00 PM. Other Posts may have some plans which have not been publicized, so check with your local Post to see what activities they might have planned.